Struggling Farmers Turn Excess Milk Into Cheese And Yogurt For The Hungry : The Salt Dairies are dumping millions of gallons of surplus milk every year. In Philadelphia, food banks are working with farmers to use that milk to make food that goes to pantries and shelters. Abner Stolztfus owns Cedar Dream dairy farm in Peach Bottom, Pa. Last year, Stolztfus decided to invest almost $200,000 in equipment and learned how to make yogurt from scratch. On a beautiful sunny day recently in south Lancaster County, Pa., farmer Abner Stolztfus and seven of his eight children were inside, bottling yogurt in a room next to the barn. "The younger one is only 2 months old, so she's not working out here yet," he said, laughing. 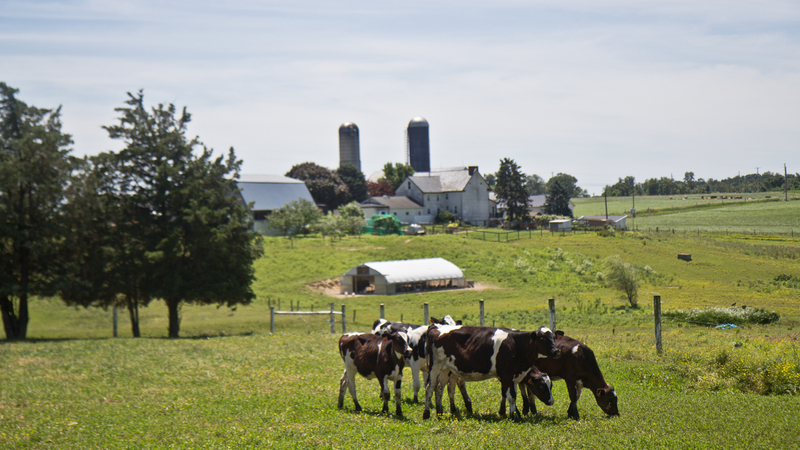 Stolztfus and his family own Cedar Dream dairy farm in the town of Peach Bottom in southeast Pennsylvania. He and his kids milk 50 cows twice a day — at 5 in the morning and 5 in the afternoon. His family has been farming for generations. "I learned milking cows before I started going to school," he said. But yogurt is a whole new business for him. Dairy farmers like Stolztfus have been struggling financially during the past few years. While new technologies have allowed farms to produce more milk, fewer people are consuming it. That's causing milk prices to plummet and creating a surplus that often ends up going to waste. According to the Center for Dairy Excellence, Pennsylvania lost 120 dairy farms in 2016. In that same year, dairy farmers across the country dumped 43 million gallons of excess milk. So last year, Stolztfus decided to invest almost $200,000 in equipment and learned how to make yogurt from scratch. Today, he produces about 3,000 pounds of milk and yogurt a week. His No. 1 seller is drinkable yogurt, a light but creamy, all-natural yogurt. Things were not easy at the beginning, though. With an upset market, he struggled to find customers until an unlikely client emerged: Philabundance, the local nonprofit that turns food waste into donations. Forty percent of all food produced in the United States ends up in landfills. Yet in Philadelphia, 1 in 5 residents doesn't have enough to eat. To combat waste and help feed hungry people, Philabundance is rescuing perfectly good milk that was going to be dumped to make cheese and yogurt for families in need. In the process, it helps farmers like Stolztfus. "We are testing out a new model with him where we work with another farmer to source excess skim milk from his butter production," said Kait Bowdler, director of sustainability at Philabundance. "Every time you produce butter, there's the whey and the skim that's left over, and a lot of that ends up being thrown out." Skim milk can be processed into other products, such as cheese or yogurt. But because dairy farmers are struggling, they are left with no money to pay for that processing and end up dumping it. The same happens with other types of milk. "Think about it: Cows still produce the same amount of milk no matter what you use it for, and if a co-op says that you can only produce a certain amount or that they can buy a certain amount, you end up having to throw that out," Bowdler said. Last year, food banks statewide came up with an idea. Using funding from the Pennsylvania Agricultural Surplus System and donations from the dairy industry, they got 12 tanker loads of surplus milk that a local co-op was going to dump. (Milk-transport trucks can hold anywhere from 5,000 to 8,000 gallons.) They took the rescued milk to local cheesemakers and made thousands of pounds to give away free at food pantries and shelters. For farmers, it meant total revenue of $165,000. Philabundance purchased 27,680 pounds of that cheese for donations, but then took the idea one step further. It bought more milk to make more of the same cheese, this time to sell in fancy food stores in Philadelphia, under the brand Abundantly Good. For every pound of cheese sold, $1 goes back to the farmer to process milk into free cheese for hungry people. Giving people in need food of the same high quality as that sold in gourmet stores is what the whole program is really about, Bowdler said. "It's rebellious in a way, it's saying that people who are poor don't just need to take whatever you give them — we can give them a better product," she said. According to Philabundance, in a year farmers have received $9,000 from retail sales — the equivalent of selling 18,000 half-pound units. That has allowed them to produce 3,500 pounds of cheese for donations. Because the program is a success, the organization is testing out a new product: excess skim-milk yogurt. Stolztfus said leftover skim milk by itself looks and tastes like colored water. But with the right equipment and ingredients, it can be transformed into yogurt. "We pump the skim milk in there [the pasteurizing tank], we heat it up, to about 108 degrees, and we add the culture. We let it incubate for 12 hours, and we stir it back up, add the flavoring, sugars, and mix it up good, and that creates the yogurt," he explained while overseeing bottling of the product. At the end of the day, Stolztfus transforms 4,500 pounds of skim milk that might have become waste into 4,500 pints of drinkable vanilla yogurt for people in need. "It's a very good way to get people drinking more milk, getting dairy in them...," Stolztfus said, "It's a very good feeling, it makes me feel really good." And it helps him pay his bills. For now, Philabundance is paying Stolztfus to process the excess skim milk from butter production into both drinkable and spoonable yogurt. But if the Abundantly Good program grows, the organization will try to sell the yogurt in stores, and have the retail sales pay for food donations. In July, a new retail product will debut: spiced tomato jam. Proceeds from sales of the jam, produced in collaboration with TBJ Gourmet, will go to provide tomato sauce and soup donations for people in need. This story comes to us from member station WHYY in Philadelphia.